After revealing her love of babies in I Love You, Baby, From Head To Toe!, Karen Pandell turned to another one of her favorite subjects with Where’s Stretch? 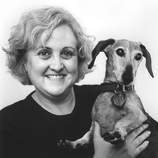 Based on the author’s real-life dachshund, Stretch, here is a comical laundry-day chase that invites readers to lift the flaps to help a family ferret out their missing dachshund. The elusive Stretch returned in a sequel, Peekaboo Stretch! Born in Massachusetts, Karen Pandell has also spent time in Alaska, Hawaii, and Japan. She now lives in New York with her husband and their celebrated dachshund.